Big blockbuster films always find plenty of cross promotion opportunities to hype up the release. However, most of them simply include a cheap connection with the film by way of a sandwich named after the characters or a set of "collectibles" that you'll find at Goodwill in a few years (and will inexplicably be worth hundreds decades later). 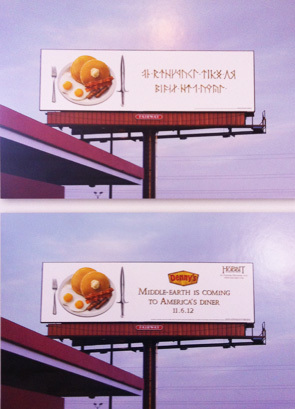 So when we were invited to check out a sneak preview of a new cross promotion between the Denny's restaurant chain and Peter Jackson's The Hobbit, we were a little skeptical. However, my trip to corporate headquarters in South Carolina, where I ate like a Hobbit, changed my mind. Let's be honest. 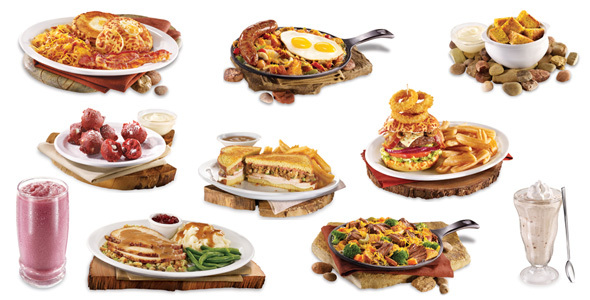 When it comes to fine-dining, you don't necessarily think of Denny's. As I told executives before The Hobbit presentation, the last time I was there was over the summer for some very late night food and coffee (after all, they're always open). But in the case of this new event for The Hobbit: An Unexpected Journey, over time it became clear that a lot of thought went into crafting this delicious promotion that Peter Jackson personally approved himself, giving Denny's the promotion deal over plenty of other heavy hitters in the food industry, and the result was food that I find myself craving again now. But the real showcase comes from the star of this promotion, the delicious Hobbit inspired meals. Now some of these meals are slight modifications of some familiar items on the restaurant menu, especially around the holidays (for example, Gandalf's Gobble Melt and Dwarves' Turkey and Dressing Dinner is a holiday staple). But there are more than a couple items that were crafted (by head chef Scott Richard who is a real Tolkien fan) especially just for this promotion which The Hobbit fans will truly enjoy. There's Pumpkin Patch Pancakes and Seed Cake French Toast for breakfast (or you can have it cut up as Lonely Mountain Treasure for a tasty dessert), a Shire Sausage Skillet, a Hobbit-Hole Breakfast (but what about second breakfast?) and the Lone-Lands Campfire Cookie Milkshake. The food itself was crafted with the rustic setting of Middle Earth in mind. In addition, not any simple link to The Hobbit was cleared for the promotion. There were plenty of ideas that didn't come through this time because certain elements don't appear until the second or third film (though if this promotion works well, you can bet you'll see some of those surface in 2013 and 2014). So there's no spoilers to be found in these eats, and the delectable food for breakfast, lunch, dinner and dessert (click the below picture for a closer look) makes for a solid gathering of feasting with friends after seeing a midnight show December 14th. But The Hobbit goodness doesn't stop at the food. 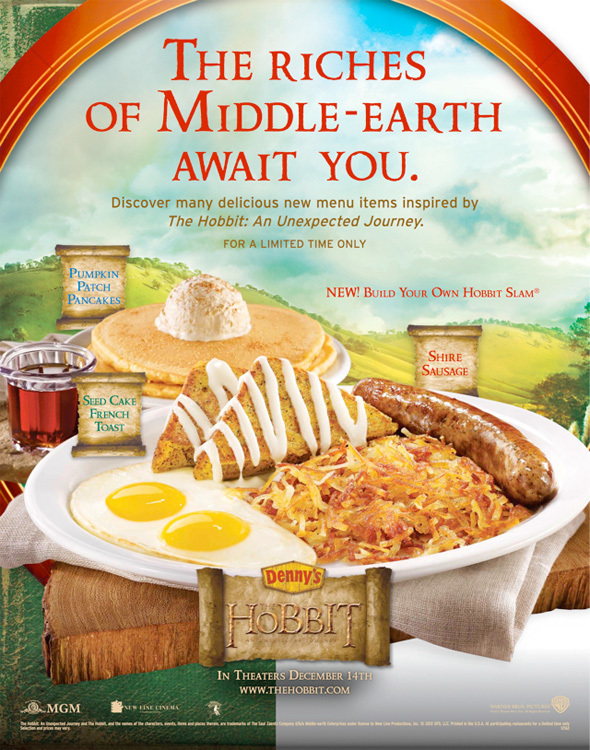 At Denny's official website there will be a Hobbit Hub which will have trailers and TV spots, exclusive behind-the-scenes videos (which can also be unlocked with QR codes on the placemats at restaurants), trivia, e-postcards, recipes and an app that will allow you to "Hobbitize" yourself. Plus, in-store goodies come in the form of Hobbit trading cards. There's 12 cards in all and 2 extremely limited edition cards featuring Bilbo Baggins and Gandalf. A pack of cards comes with select items from the Hobbit menu. As I said before, this event initially had us rolling our eyes (it's a bit cheesy both literally and figuratively), and some of the internet will surely be whining and griping about this deal. But the thought that went into this promotion goes well beyond slapping a picture on a cup and calling it a collectible. The food creations were made with Tolkien's characters and creations in mind will please fans in more ways than one. After having a sample of each menu item, I found myself feeling like I ate, breakfast, second breakfast, elevensies,lunch, afternoon tea, dinner and supper all in one meal. It was the first time I found myself immediately craving a return to Denny's, and that's saying something. The Hobbit themed menu at Denny's arrives on November 6th and lasts until January 15th, one month after the release of Peter Jackson's The Hobbit: An Unexpected Journey on December 14th this winter. Well, at least you guys got paid for this 'promotion'...sorry, I meant 'feature'. Right? !